FF/SS-Reducing Single Sphere Nylon reinforced EPDM flex connectors are available in convenient reducing sizes. They allow for ease of installation on piping systems requiring increase or reduction in pipe size without the additional space requirement and the expense of the added reducer material and labor. Absorbs Directional Movement - Thermal movements appear in any rigid pipe system due to temperature changes. 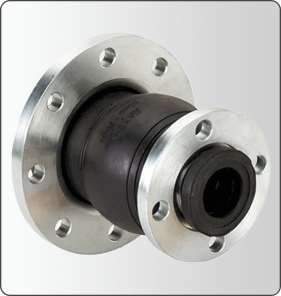 The FF/SS and FF/DS spherical expansion joints allow for axial compression or axial extension and lateral deflection as well as angular movement. Easy installation - The floating flanges freely rotate on the bellows, compensating for mating flange misalignment, thus speeding up installation time. Gaskets are not required with the FF/SS or FF/DS, provided the expansion joints are mated against a flat face flange as required in the installation instructions. Absorbs Vibration, Noise and Shock - The FF/SS and FF/DS molded expansion joints effectively dampen and insulate downstream piping against the transmission of noise and vibration generated by mechanical equipment. Noise and vibration caused by equipment can cause stress in pipe, pipe guides, anchors and other equipment downstream. Water hammer and pumping impulses can also cause strain, stress or shock to a piping system. Install the FF/SS and FF/DS molded expansion joints to help compensate for these system spikes.